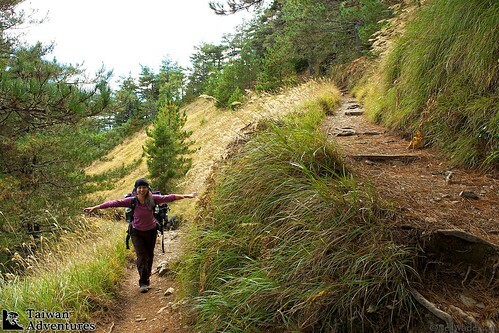 Snow Mountain (aka Xueshan, and a few other spellings) is undoubtedly one of the most beautiful hikes in Taiwan. I’ve been lucky enough to have done it several times now, and each time seems to get better and better. 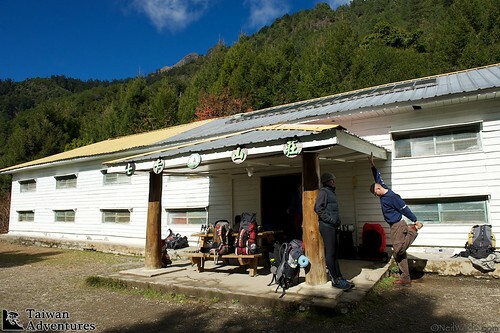 Just this past weekend, Taiwan Adventures took took a group of hikers for a two day, two night adventure on this high mountain. We had great people, great weather and a great time. 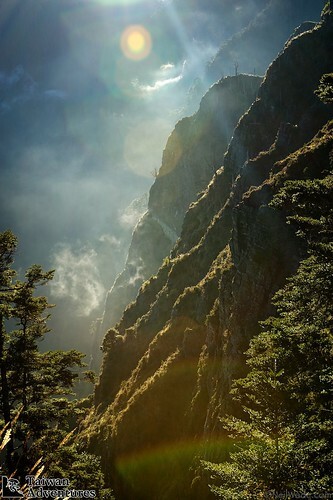 The afternoon sun highlights some cliff ridges on the hike to Snow Mountain, Taiwan. Since Stu and I have written about Snow Mountains several times before, I’m not going to write a lot, and just let you see the photos from this latest great hike. If you’re interested in going there yourself, or you want to go hiking anywhere in Taiwan, join our group hikes page on Facebook, or contact us through the website. 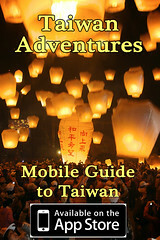 If you want to read more, here is my last report and two from Stu over at Hiking Taiwan. We set off from Taipei at 7:00pm on a Friday night. This put us at the trailhead at about 1:00am. Hiking in the dark is actually a lot more fun than you might think, hiking in the rain isn’t. But we were very lucky to wake up to crystal clear skies on Saturday morning. The hike to 369 Cabin was about as pleasant as one can get! Setting off the first night, we had a little rain but it didn't dampen spirits! After hiking in the rain the night before, we were quite happy to wake to these clear skys. The Snow Mountain hike goes through a variety of different ecosystems: several different kinds of forests, grasslands, and even a high mountain cirque. 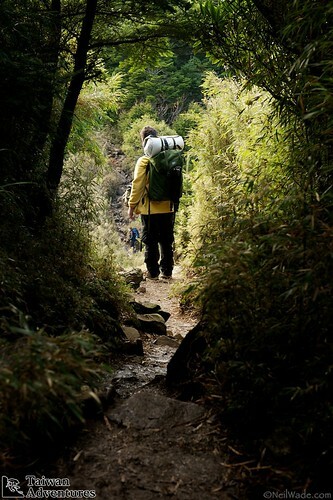 A hiker stops to admire the scenery after passing through a bamboo grove on Snow Mountain, Taiwan. Snow Mountain's East Peak has stunning views in every direction. 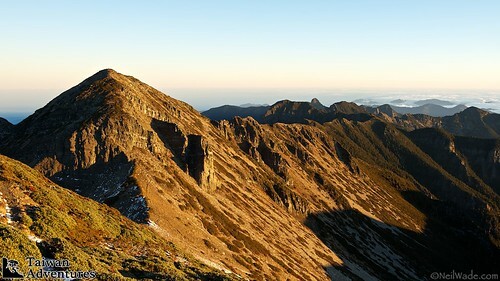 To the north is the main peak of Snow Mountain, to the east is The Holy Ridge, and to the south is Nanhudashan (南湖大山）and Zhongyang Jianshan (中央尖山). Sunday started very early at 3:00am. We hiked in the dark through the Black Forest and up to the Snow Mountain Cirque in the dark. The skies just started to lighten up as we hit the cirque and headed for the peak. Sunrise was stunning as the sun came from directly behind ZhongYangJianShan, a pyramid shaped mountain across the valley. After a few pictures and a good exploring of the peak, we headed down for the long walk back to the vehicles. 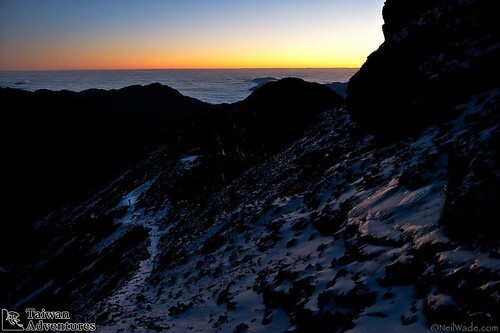 Hiking to the peak of Snow Mountain mean a few hours walking in the predawn darkness. 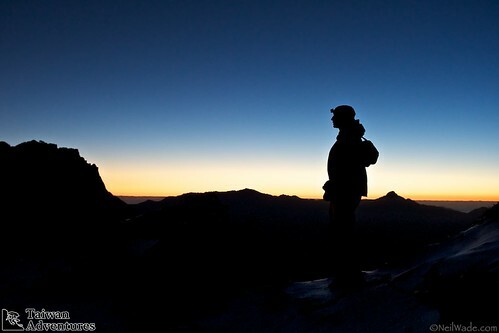 Here, a hiker walks through the cirque nearing the peak in the dark just before sunrise. A hiker is silhouetted against the the dawn sky near Snow Mountain, Taiwan's summit. Stu nears the summit of Snow Mountain, Taiwan just before sunrise. 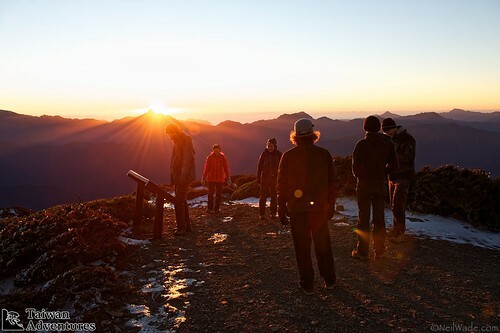 Our hiking group admires the sunrise behind Zhongyang Jianshan from the Snow Mountain Peak. Looking east from Snow Mountain Peak towards the Holy Ridge and Dabajianshan (大霸尖山). 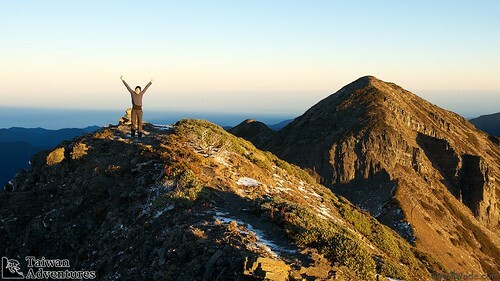 A happy hiker celebrates on the Snow Mountain Peak. 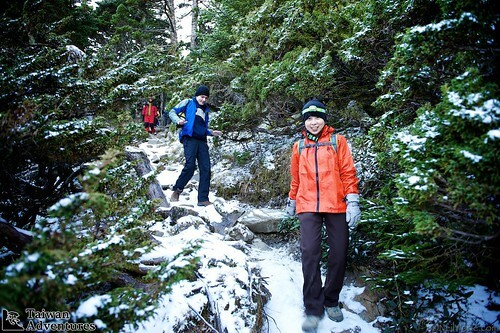 Walking through the snow and the beautiful Black Forest on the way down from the Snow Mountain Main Peak. Our great group of Snow Mountain Summiters! If you’d like to join us on a group hike, or want to organize a custom one, join our facebook hiking group or contact us at Taiwan Adventures. It looks like a great adventure, after reading you and looking to these pictures I really would like to enjoy this views by myself. By the way, impressive photograph! the first one and the hiker silhouette are really great, so creative. Wow…That looks like a great adventure. The mountain photos are incredible. Just wanted to say hi from the other side of the world in England. I love the posts you share on your blog but never made a comment. You certainly have some great adventures and capture them so beautifully. The scenery there looks amazing, I love the colour and vibrancy that is brought out through your work. Can’t wait to see what 2012 brings! Snow mountain looks like a magical place! What a beautiful place to take pictures! 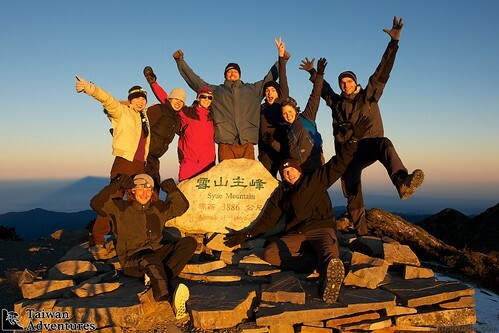 If you’re interested in going to Snow Mountain, we lead group hikes every 6 weeks or so that anyone can join. Have a look at our facebook page at: https://www.facebook.com/groups/TaiwanAdventures/ for more information on upcoming events. Wow! I didn’t know that Taiwan is so beautiful! The photos are beautiful. What a breath taking views! How high the Snow Mountain is? Thanks Aiza. Snow Mountain is 3,886m. Very beautiful images you have taken!